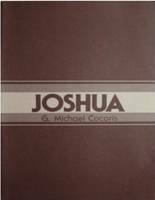 Joshua is a 125 page expositional and homiletical treatment of Joshua. It includes an expositions of the literary units of the book, a chapter that summarizes the book and a biographical study of Joshua. Joshua is available for $5.00, plus shipping and handling.